1. Lovely by the LakeThis lakeside home has enough room to accommodate 16 guests, so a large outdoor entertaining area was key. Flexible seating lets the homeowner host large or small groups, while thoughtful details keep any size party hopping. 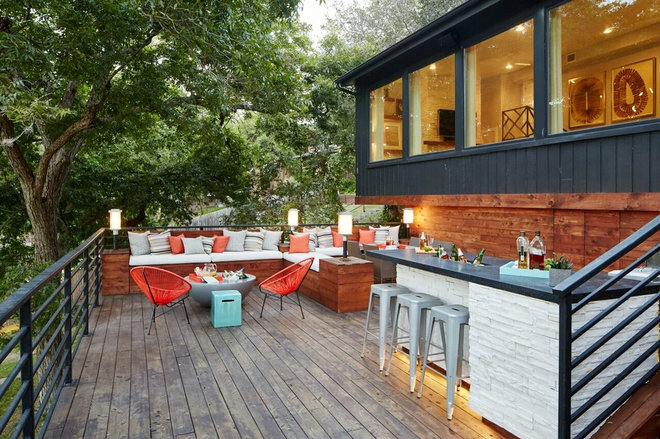 “Texas summers are hot, so we wanted to help our client look like an incredible hostess by giving her guests easy-access areas for grab-and-go-drinks,” says designer Carolina Gentry. A trough sink built into the island can double as an ice trough for soda and beer. 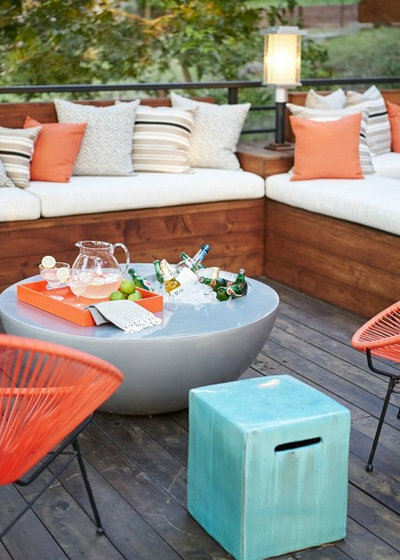 A fun coffee table also can house ice and beverages. 2. Blissful in BarcelonaYou don’t need much for a successful lounge space. 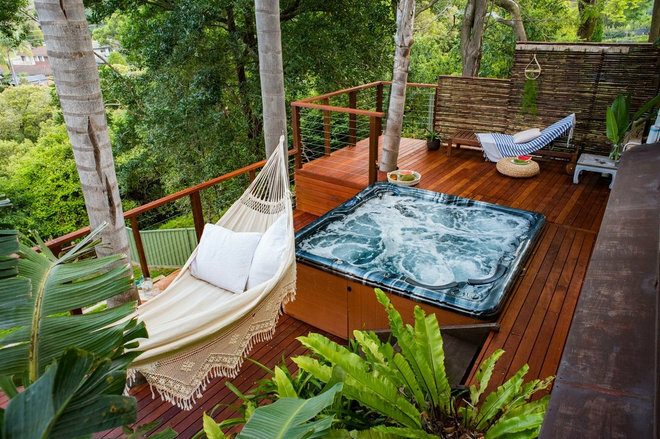 This Spanish home features a compact outdoor area with enough room for a couple of chairs, an outdoor rug and a hot tub, all encased in walls of green foliage. 3. 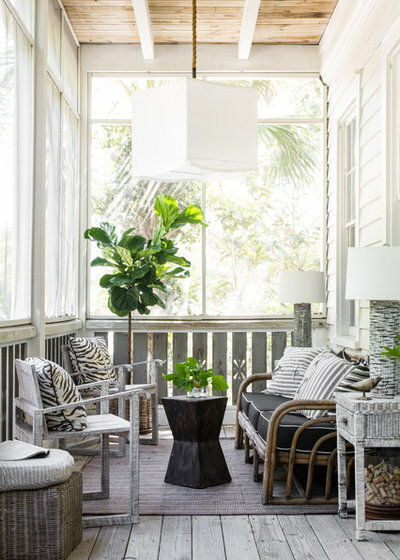 Fabulous in FloridaA front porch on an island off the coast near Jacksonville, Florida, is done up right with wicker pieces and cushy pillows. The addition of side-table lamps and a fiddleleaf fig makes this outdoor space feel like an extension of the interiors. 5. Awe-Inspiring in AustriaPlush cushions on wood-frame furniture, two large coffee tables and an old-world-style light fixture lend a homey vibe to an otherwise rustic outdoor space in the Austrian countryside. 6. 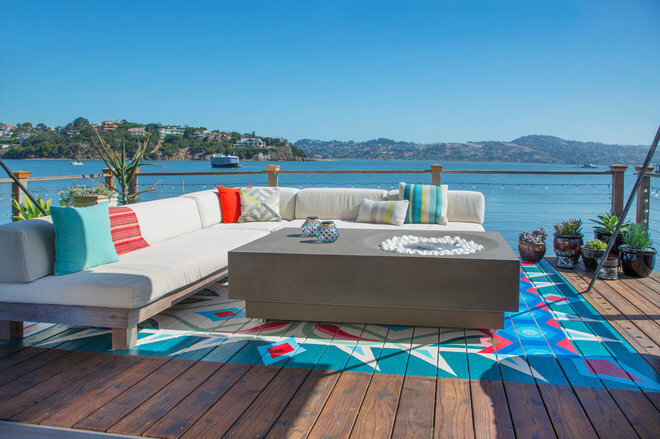 Sunny in SausalitoA colorful, graphic painted deck design energizes this lounge atop a houseboat on San Francisco Bay. 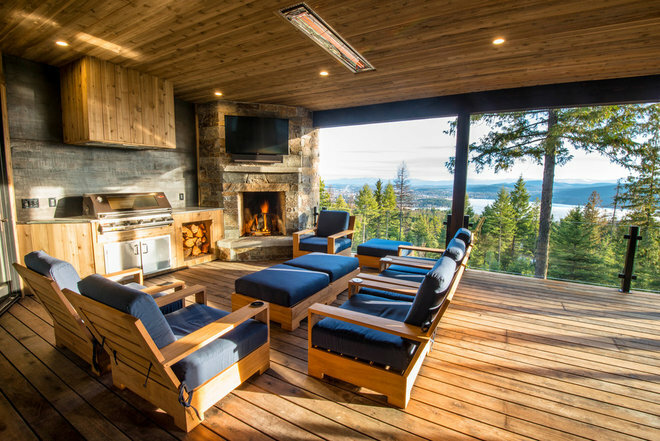 A steel cable rail doesn’t disrupt the view, while string lights can quickly turn this spot into a late-night party perch. 7. 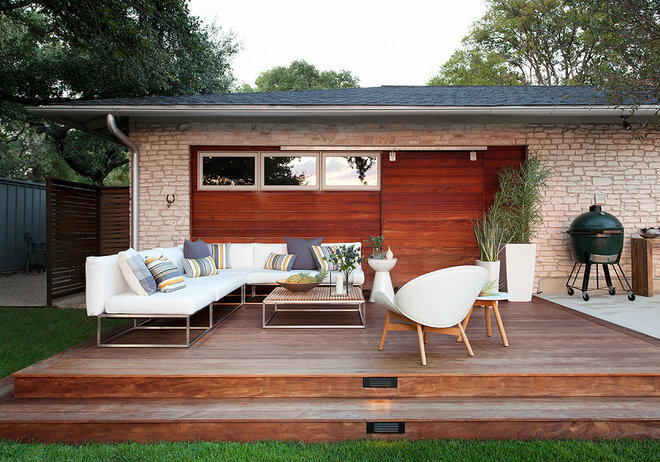 Alluring in AustinModern white furnishings pop against a feature wall and a rich wood deck overlooking a hilly Texas landscape. 8. 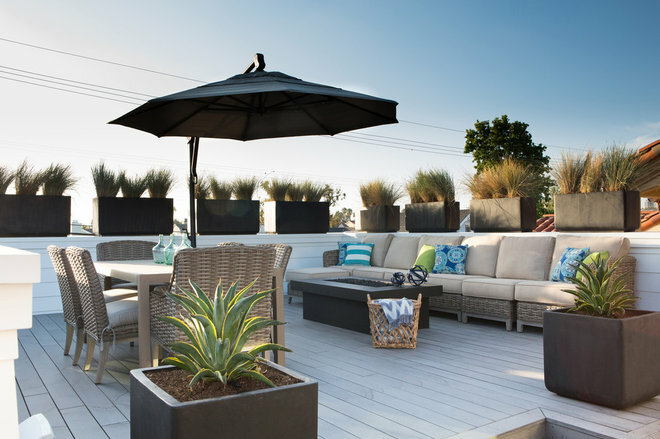 Laid-Back in Los AngelesWispy grasses in container boxes create a private hideaway at a beachside Los Angeles home. Cushioned furniture and a fire-feature coffee table complete the lounge vibe. 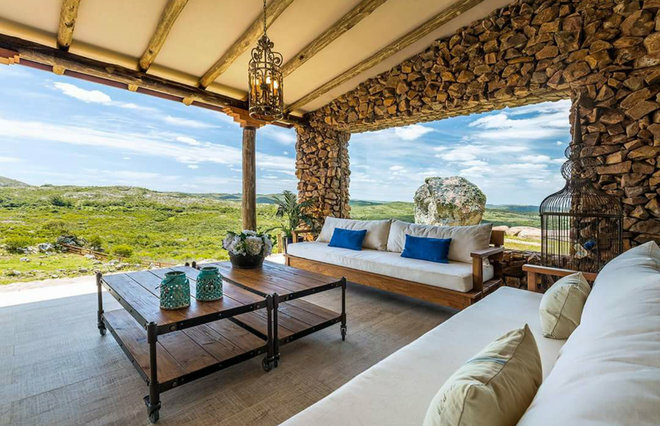 “We decided to keep the furnishings neutral and allow the colors of nature to stand out, such as the blue of the ocean or sky, or the greenery in the landscaping,” says designer Megan Crane. 10. Enchanting in EnglandIt’s not just the comfy sectional and the leafy surroundings that make this a successful lounge. The subtle dollops of color bring vibrancy. 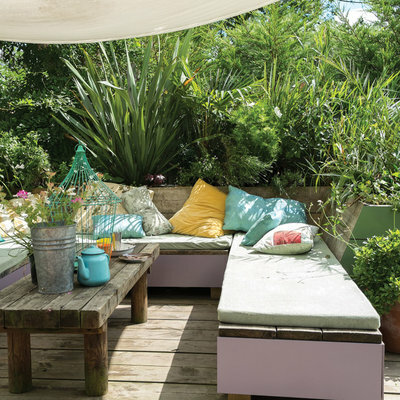 The painted wood furniture base and the combo backrest-raised planter are particularly nice touches.